It's Muffin Tin Monday again! This past week I was busy creating meat and mushroom pies from our grass fed beef. We thought they were pretty tasty. 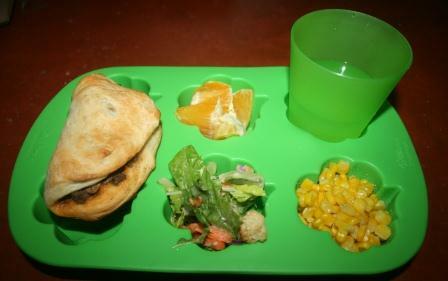 I served the meat pies with oranges, a salad, corn, and water. Have I ever mentioned we have really tasty water? It is well water that fills from mountain springs, and it's really delicious! I did lots of green, since my St. Patrick's Day muffin tin was a bit of a flop. I think this one looks much cuter! On a side note, I have turned off anonymous comments for a short time. I am getting way too much spam everyday from anonymous commenters, and I've grown tired of weeding through so much in my spam folder. Hoping that turning it off for a bit will stop these folks from coming to my blog and leaving 10 comments a day on various drug websites. Sorry for any inconvenience! To see more fun ideas of meals for kids, check out Muffin Tin Mom. This is really cute! I like the way the glass fit right in there. Everything looks so good! This really looks wonderful! I bet the water is delicious! Those meat pies sound yummy!!! Have a great Monday! !! Lucky you for having tasy water. I grew up with taty water but now we have city water and it is horrible. The meat and mushroom pies sound great. A little like the kraut burger's we make. The meat pies sounds very nice! Those meat pies sure do sound (and look) yummy! The water at our property (where we eventually plan to build a house!) is delicious too! I love good water!! Looks yummy! It's so nice to see a Mom that's concerned about her children's diet. Plus, you always give me ideas on healthy side items to serve with the main dish. St Patricks Day is such a fun food holiday! Your muffin lunch looks so green and fun! Grass fed beef is the best. I bet you make a real tasty meat pie! Happy Monday! That may be a kids sized meal, but it looks delicious! And it's nice you have such good water. The pies sound glorious.I liked how you enjoyed the bear in the old trailer. I'm super curious as to how your water tastes now! These muffin tin photos never cease to make me smile when I open your blog. Love it! We had well water for my entire life until a few years ago...our water tasted alright but it had tons of iron in it. All my clothes had an orange tint. Meat pie sounds downright mouth-watering! I made a Shepherds pie once, and I loved it, but hubby didn't. I like the green tin! Yum, those meat pies sound good. Are you going to give us a recipe, or have you already? Yum. The meat pie looks and sounds delicious. How pretty! Too bad about the spam,there are always people who will ruin a good thing for everyone. Meat pies!!! I was just reading in the paper that they are really making a comeback, there is s restaurant in D.C. that is selling all kinds and people come from all over for lunch and dinner. Maybe you started a trend and didn't even know it! Yum! What a great looking lunch! I always enjoy these muffin tin posts. Wished you could deliver! Your water does sound delicious!!! Ridiculous spammers. love the sw virginia water! Num! Everything looks so good! We are eyeing up the meat pies! I love making meat pie! Looks delicious! Your tin is fun and everything looks delicious.